MamaBreak: ModCloth Grab Bag Event! Black Friday and Cyber Monday have passed us by in a flash! But that doesn't mean great deals aren't out there any more! ModCloth has a sweet Grab Bag worth $50 that they are giving away with any purchase of $125+ until Midnight Tonight!!! ModCloth is not just clothes either, they have adorable apartment accessories and even have a small selection of quirky gifts for that special guy in your life. Check them out using the link below and get that grab bag for yourself! 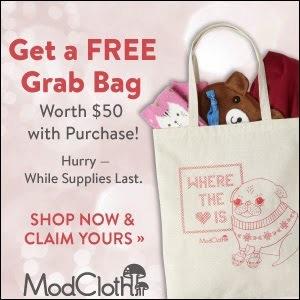 ModCloth Grab Bag Sale until Midnight Tonight!